La Paz, capital city of the Mexican State of Baja California Sur, is located 130 kilometres north of Los Cabos on the Gulf of California (also known as the Sea of Cortez). It’s home to about 250,000 people, so it’s smaller than Victoria but bigger than Kelowna. It offers all the attractions and activities one would ask of a relax-and-put-your-feet-up style of vacation, but it does so with sides of substance that elude your typical all-inclusive holiday destination. 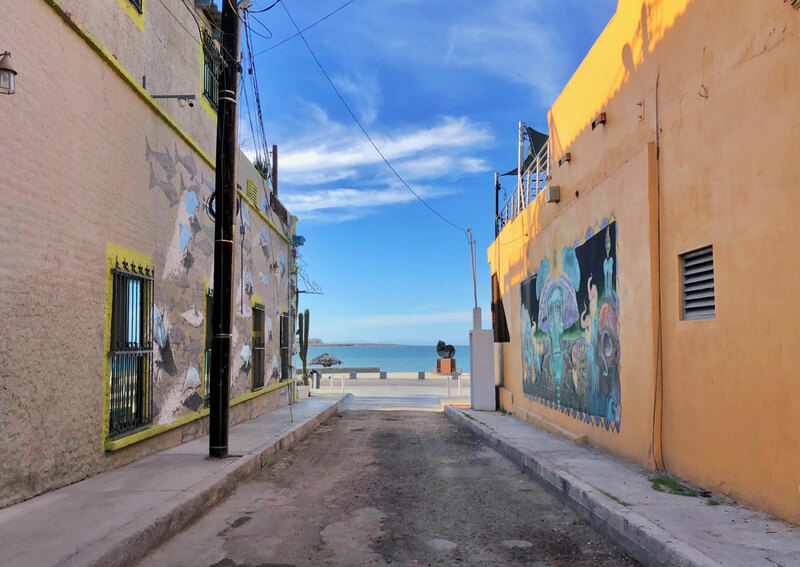 Indeed, unlike other places I’ve been to in Mexico, La Paz doesn’t feel like it revolves around tourists, and part of what makes it feel so welcoming is the pleasure its people take in watching others fall in love with the place they call home. The dense, low-rise townscape is broken up by pedestrian-only side streets, courtyards and squares. This makes it especially friendly to wanderers. Traditional Mexican tile work, murals and painted trim brighten the sturdy colonial architecture (the town was founded in 1535). Cats lounge in the sunshine. Spanish laughter floats along with the dust and mixes with the salt air. There are spice vendors, tiny produce stands and street food carts, as well as modern coffee shops, artisanal tasting rooms and high end restaurants. It’s a vibrant city; an interesting place to vacation in and of itself, but visitors come here for other things besides. They especially come for the ocean, the marine life and the UNESCO protected World Heritage Bio-Reserves. This is the place that Jacques Cousteau referred to as “the world’s aquarium”. La Paz is a hub of marine-based eco-tourism; not only famously home to Gray Whale breeding grounds, Whale Shark feeding areas and a massive Sea Lion population, but also rich in bird life and uncommon plant species. Measuring from 12 to 16 meters long and weighing in the neighbourhood of 20-35 tons, Gray Whales migrate between the Arctic and Baja California Peninsula from January through to April. They visit the protected waters of Magdalena Bay, which act as a natural nursery and breeding ground. Tours take sightseers within feet of whales. Curious calves will swim up to boats under the watchful eyes of their mothers. The number of boats (and the rules once on board) are strictly monitored to ensure the whales are respected. On my visit, Marine biologist Isaac Benitez Ortega (Choya Tours) was on board to explain whale breeding, behaviour, and migration. Aside from the thrill of being close enough to touch a Gray Whale, the thing that made me smile the biggest was that even with all his experience on these waters, this Marine Biologist was still overcome by the excitement of being so close to a mammal of such size and grace. A 45 minute boat ride from La Paz gets you to Isla Espiritu Santo. This tiny rock island off the coast is home to one of the most robust Sea Lion colonies in Mexico (as well as a stunning coral reef). Being off the coast, the water here is deep, with a mesmerizing emerald green hue. Again, under the experienced eye of a trained guide (Adrian of The Cortez Club), myself and a boat of six other passengers jumped in and spent an hour snorkelling around the island. The visibility of the water was fantastic and the colours in the coral, tropical fish and red rock of the island were captivating. The best part, though, was that we were joined by playful Sea Lions who seemed to genuinely enjoy the sport of racing past our wetsuit clad bodies to show us what ‘speed and agility’ really looked like. Though accustomed to being in close proximity to big creatures in the water by now, I still wasn’t fully prepared for my swim with a Whale Shark. They are the largest fish on the planet; we’re talking 12-30 ft and up to 20 tons! In addition to their significant massive size, they sport unnervingly large mouths (1.5 meters wide). Thankfully, the slow moving fish come to Baja California Sur to fill up on plankton. They are, in fact, so disinterested in humans that it’s borderline rude. Still, when you see that mouth opening in your direction under water, the adrenaline definitely gets pumping and it’s nice to know you have a trained professional nearby to hold your hand and remind you to breath! The Museo De La Ballena (Museum of the Whale and Sciences of the Sea) is a great place to prepare yourself prior to whale watching (or to fill in the blanks afterward). Cetaceans, chelonians, pinnipeds, sirenians, elasmobranchs – this approachable collection schools you on them all. Wander through the exhibits on your own or tag along on a volunteer-led tour. The curated line-up of specimens, educational materials and cultural artifacts give context to the experience. The people of La Paz recognize that maintaining the health of the region’s unique ecosystem is critical to supporting the wildlife that attracts tourists, but caring for both land and ocean goes beyond any economic motivation here. Respect for all aspects of the environment is part of the cultural identity of La Paz. The locals are genuinely proud when they see a visitor moved by their first encounters with nature in their part of the world. That pride was one of the things I found most compelling about my time in La Paz. It reminded me that a reverence for one’s immediate environment shouldn’t feel so rare. Exploring the waters around La Paz can work up an appetite. Luckily, eating here is easy. I found plenty of street food; tamales, tacos, fruit stands, bakeries — the sidewalks and public spaces were dotted with vendors. But La Paz also has a lively restaurant scene that runs all day and well in to the night. I’m of two minds when it comes to breakfast on vacation: slow and in bed or a deliberate jumpstart to an activity packed day – La Paz had both. The CostaBaja Resort & Spa where I stayed offered a breakfast buffet, as well as in-room coffee and tea. Some mornings I made coffee and read in bed (or took my coffee down to the beach). Other mornings, I went to town to relax at the Big Sur Cafe Organico, a small coffee shop that not only offers beans from different regions in Mexico (all freshly roasted in house) but also serves delicious pastries. Bonus: later in the day they start serving all manner of boozy coffee concoctions. Vacation lunches tend to lean toward indulgence, and sometimes the path of last resistance is the way to go. But finding somewhere to eat that is both easy and healthy is a score. In La Paz, the adorable Capuchino Cafe was the perfect place to feel part of the local community and eat light, nourishing food between decadent feasts. The bright, modern space matched the menu (which included salads, juices, smoothies and healthy snacks like veggie burgers and falafel). My favourite was the potato tortilla made with egg, potato, onion, spinach, poblano peppers and “lots of love”. Also great for lunch was Restaurant Bismark. With its massive seafood platters and sidewalk seating across from the ocean, the local institution (since the late 60’s) is famous for lobster but does a stellar job of capitalizing on all that the Sea of Cortez has to offer. In the evening, La Paz buzzes with friends and family gathering for dinner and drinks. There are streetlights, but somehow the nights are a little darker here and the glow of lanterns and light bulbs strung across courtyards guide diners between restaurants and bars. Options range from counter-service taco joints to restaurants of the white tablecloth and candlelight variety. Toward the fancier end of the spectrum are Sorstis, Nim and Steinbecks. With its stunning outdoor courtyard and Mediterranean menu, Sorstis is a popular destination for special occasions. They are particularly proud of their cured ham from Salamanca, Spain, which is carved at the table when ordered. Also polished, but less traditional, Nim features design-forward decor and a contemporary menu that changes to respond to the freshest fish, game and vegetables the kitchen can get their hands on. A short drive out of town, Steinbeck’s (John Steinbeck wrote “The Pearl” in La Paz during the 1940’s) is located at the Hotel Costa Baja. The open air dining room uses an onsite mesquite wood grill to cook fresh fish and smoked chicken. Bonus: Steinbeck’s is home to the largest selection of Tequila in La Paz and is located next to a marina which is skirted by a pedestrian walkway that makes for a lovely post-meal stroll. La Miserable Mezcaleria was the highlight of my land-based experiences in La Paz. The simple two room bar and tasting room (with enclosed patio) offers tasting flights and mescal-heavy cocktails. Historical photographs, curious artifacts and retro paintings signal substance, and the bright but easy colours throughout make it a fun place to be. This is a place to taste, learn and relax. Located on The Malecon (the seawall), Rancho Viejo started as a street vendor and was so popular with locals that the outfit grew to a restaurant. Here, diners select meat by weight and it is delivered with warm tortillas, salsas and condiments. The beer is cold and the margaritas are fantastic. Accordingly, it’s always busy. Bonus: it’s open 24 hours a day. With jet lag and long days of adventuring, it’s nice to know there’s somewhere to snack and sip at off hours! Street art cat and fish. La Miserable Mezcaleria, La Paz. Beads hanging on display, La Paz. Bright Colours and rich smells in a spice shop in La Paz. Bird Life, near La Paz. Walking The Malecón in La Paz. Gray Whale Watching in Magdalena Bay. This way to Whale Sharks! A table waiting at Capuchino Cafe. Man waiting for bus, La Paz. Heading out to swim with Sea Lions. Waiting for Whale Shark tour at The Cortez Club. Marine biologist Isaac Benitez Ortega schools visitors on whale breeding, behaviour, and migration. Sea Lions on the rocks of Isla Espiritu Santo. Sunshine and shadows in La Paz. Seaside lunch at Bismark, La Paz. Although the CostaBaja Resort & Spa comes with all the amenities you’d ever want (Tempur-Pedic beds, Egyptian cotton sheets, WiFi and mini bars), the 115 room property has a quiet, classic and attentive vibe. Nestled comfortably between ocean and hillside on a slice of arrestingly beautiful beachfront, the CostaBaja is only a short shuttle ride from town, but with several restaurants, a marina, water sports equipment rentals, tennis courts, golf and an award-winning spa on site, travellers could almost be forgiven for never leaving the grounds. This trip would not have been possible without the generous assistance and guidance of the La Paz Tourism Board.